Combining two programs into one fun-filled week of learning allows you to receive certification in two areas while immersing yourself into the sailing lifestyle. Spend 6 days and 5 nights learning to sail the Atlantic Ocean. Depending on your chosen courses, you will be spending your nights aboard either at our marina, at anchor, or docked at Bald Head Island Marina (a 25 to 30 mile ocean sail). Upon completion of one of our combo courses, you will have the knowledge to skipper or crew a sailboat safely in the ocean, along the coast during the day, in moderate winds up to 20 knots. Private lessons are available for an additional $300 per course. Each individual and combination course, with the exception of ASA105 Coastal Navigation, is flexible schedule based, allowing us the freedom to schedule our classes based on your needs. Combo 1 teaches the beginning sailor the required skills to cruise safely as both skipper and crew on an auxiliary powered sailboat in near-coastal waters. Days 1-3 you will learn basic sailing terminology, parts and functions, helm commands, basic sail trim, points of sail, buoyage, seamanship and safety including basic navigation rules to avoid collisions and hazards. 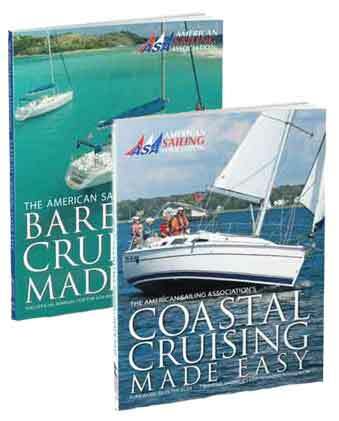 Days 4-6 you will learn cruising sailboat terminology, basic boat systems, auxiliary engine operation, docking procedures, intermediate sail trim, navigation rules, basic coastal navigation, anchoring, weather, safety and seamanship. Anchoring overnight away from our marina is included to prepare you for life aboard. INCLUDED: Instructional Materials & Testing, 1 Year ASA Certification Membership, Meals while Aboard. Combo 2 teaches the intermediate sailor the required skills to cruise safely as both skipper and crew on an auxiliary powered sailboat in near-coastal waters, then advancing to a multi-day cruise upon inland/coastal waters in moderate/heavy winds and sea conditions. 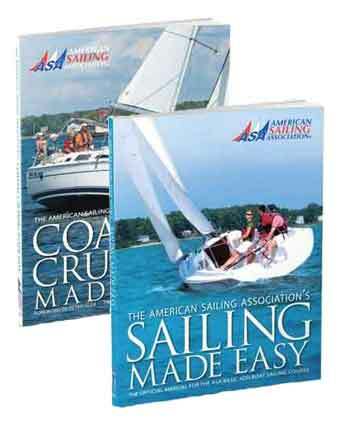 Days 1-3 you will learn cruising sailboat terminology, basic boat systems, auxiliary engine operation, docking procedures, intermediate sail trim, navigation rules, basic coastal navigation, anchoring, weather, safety and seamanship. Days 4-6 you will learn about provisioning, boat systems, auxiliary engines, advanced sail trim, coastal navigation, anchoring / mooring, docking, emergency operations, weather, and more. This course includes anchoring overnight at Bird Island or another anchorage as well as a 25 to 30 mile ocean sail to Bald Head Island, NC. to prepare you for life aboard.